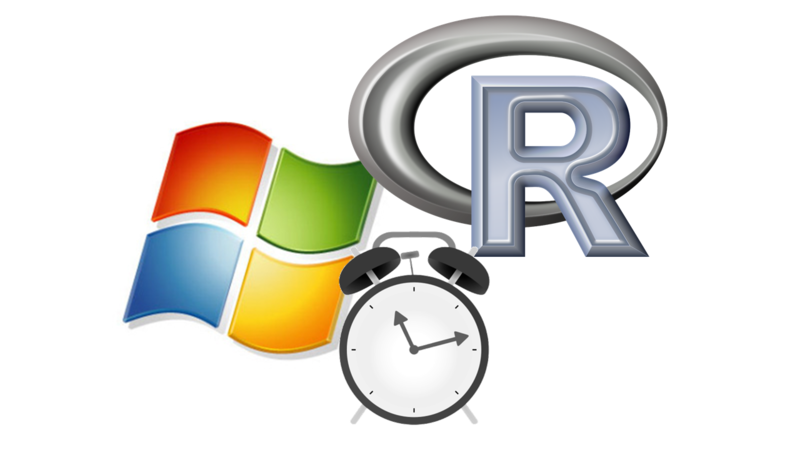 This post will allow you to impress your boss with your strong work ethic by enabling Windows R users to schedule late night tasks. Picture it, your boss gets an email at 1:30 in the morning with the latest company data as a beautiful report. I’m quite sure Linux and Mac users are able to do this rather easily via cron. Windows users can do this via the Task Scheduler. Users can also interface the task scheduler via the command line as well. As this is more process oriented, I have created a minimal example on GitHub and the following video rather than providing scripts in-text. All the scripts can be accessed via: https://github.com/trinker/Make_Task User’s will need to fill in relevant information (e.g., paths, usernames, etc.) and download necessary libraries to run the scripts. The main point of this demonstration is to provide the reader (who is a Windows user) with a procedure for automating R tasks. This entry was posted in r, Uncategorized, work flow and tagged R, rinker, task scheduler, trinker, tyler rinker, windows, work flow. Bookmark the permalink. Second point is a pro-tip, on various machines I have had inconsistent behavior with whether “R.exe” or “Rscript.exe” is in the “path” environment variable, (so simply using “R CMD BATCH” will not find the R.exe to run.) Ditto for basically every program I’ve ever installed on windows. If that is the case, you can just call the exe file directly with the full path name to both the exe file and the “.R” file (enclose in double quotes if spaces in either path). (You can add R.exe to the path environment, but that is just as annoying and limits portability to new machines.) This advice basically extends to any automated task you want to do in windows, figure out the command line prompts, put them in a plain text “.bat” file, and then make a scheduled task. If whatever program you call is in the path environment, and the bat file is in the same folder as the “.R” file, you don’t need to specify the paths at all. @apwheele Thanks for the additional info. Error: pandoc version 1.12.3 or higher is required and was not found. But when I run in RStudio manually everything is works. Anyone has ideas how to solve this? 1- Can I email to multiple users at once? 2 – The packages that I downloaded while running task.r now reside on my machine locally or they have dependencies on your website or github still?. A more straight forward question, If you delete all the code from github today, I would still be able to send automated email and reports? Thanks and sorry for the naïve questions. Thanks! Very helpful and useful! Thanks for the added info and link. LoadLibrary failure: %1 is not a valid Win32 application. I think this means that R doesn't know where Java is located. I installed Java, but I am still getting the same error. I tried running loading the rJava package – using library(rJava) – and it loads without any error. This will let R where Java is. I had to type in the full location of the R.exe and the R script as @apwheele said otherwise it did not work at all. Hi Jordan- I ran into the exact same problem. Try this using CMD BATCH (your code is just BATCH) and put lines 2 and 3 on the same row. Any ideas on how to solve this? Thanks everyone. You are the man. Everything looks to be working perfectly. Thanks again for the help! This video is awesome. Geração de Gráficos e outras apresentações agendadas. Thank you very much for the detailed tutorial. I followed all the steps, including apwheele’s suggestions (added the R.exe path the environmental variables), but when I click on the .bat file, the rompt starts and immediately closes. The script doesn’t execute. I store plotly.R & variables.R in the same folder as the main script. What am I doing wrong? Any advice is much appreciated! Why .bat file doesn’t run the script? I’m unsure why your bat file didn’t run but what did the output file from R look like, the R.out? If that’s not there then R didn’t even run and the .bat file is set up wrong. I have an R code that does something and then sends an email to a list of recipients when the code has run. When run on Rstudio – the code runs successfully (i.e. all the necessary files are created) AND emails are sent out successfully. When run via Windows Task Scheduler – the code runs successfully (i.e. all the necessary files are created) BUT emails are not sent out. I am just not able to figure out why a part of the code is running fine on both Rstudio & via task scheduler, and another part only runs on Rstudio? Following are two pieces of code that I am using to send out emails – both are working fine enough when run on Rstudio. Would you know what might be happening here? I have the same batch file with RDCOM setup as Ankur, and running into same issue. When the “Run whether user is logged on or not”, my task runs and the output is created, but RDCOM is not sending the email. All runs OK when the box is not ticked… However, I’d like to be able to run tasks even when my computer is logged off. Any ideas why RDCOM gets stumped by the user context? Failed to create COM object: Access is denied. On your path to attach file, change “/” to “\\”. That worked for me. This was an awesome post! It worked great (with the addition of apwheele’s suggestion). I’m having a similar problem to Ankur’s above, but I don’t have the option of checking the “Run only when user is logged on” button, as this scheduled task is run on a remote server. The task works as expected when a user is logged in (both scheduled and force-run), but if the user logs out, the task completes, but no email is sent. I’ve confirmed that sendmailR is installed in the local library for both the user account that runs the task, as well as the C:\Users\Administrator directory. Any thoughts on what else to try? Pingback: Track your local R scheduled tasks with CommandCenter2000!!! Thanks for this. Has really helped me build the case for using R at work. Cheers! I´m a user of some of your packages, I´m from Spain. Thanks. I´ve a trouble with mi project. In few words, I have a script in R, that scraps the web to get the securities of the spanish values. I have my script in one hand, my R file, and finally my file .bat to schedule the action. It doesn´t works, I don´t know why? How can you help me, If you a able to of course. I´m sure that Im doing a lot of things wrong, so I give you my codes. I used outMail[[“Attachments”]]$Add(“path_to_attach_file”) line of code to add attachment but didn’t work. Just to confirm: Is “path_to_attach_file” the current directory? What if I want the script corresponding to the .bat file to use variables and functions that belong to the working directory, but are not self-contained within that file? Currently, when I run the bat file, it gives me an error due to the fact that I am calling a function from another script. Yes, I could solve this by placing the fun in the script, but I also need to use global “counter” variables that need to be tracked over time. Thanks for the help! !